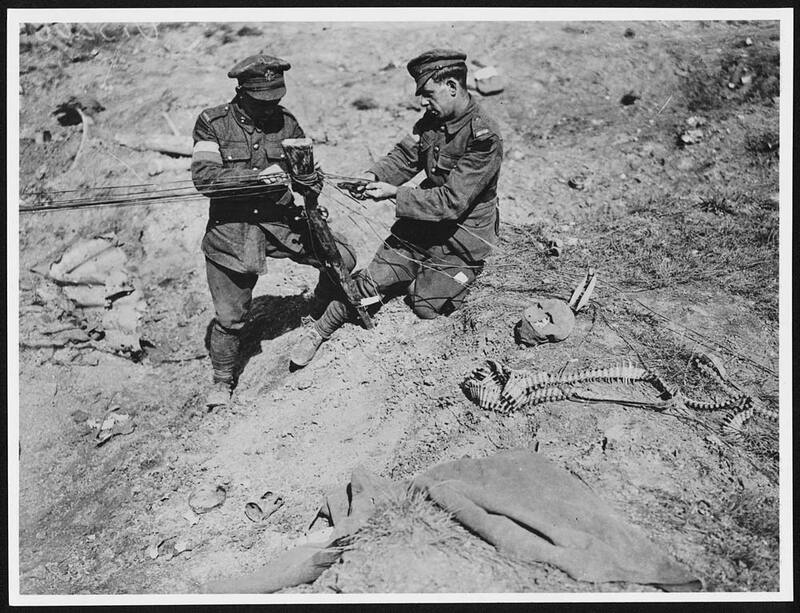 Canadian soldier in captured German trench during the Battle of Hill 70 in August 1917. 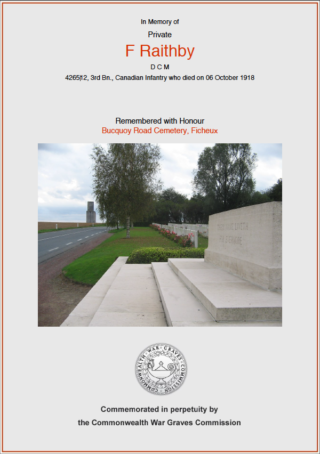 Frank Raithby was one of five men named on the Bottesford War Memorial who served with the Canadian Expeditionary Force (CEF) during WW1 – Charles Bend, Arthur Gilding, Frank Raithby, Charles Pacey and Robert Turlington Noble Page. All five emigrated to Canada in the early 1900s. None survived. The second son of Charles, and Ellen Raithby, Frank was born on the 17th January 1884 at Hogsthorpe in Lincolnshire. Charles and Ellen Raithby were married at Spilsby in 1880. Charles’s mother had died when he was three and he was raised by his father Thomas Raithby who worked as a farm labourer. Charles grew up to work as a farm labourer and then as a miller. The Raithbys had a family of six children by the time Charles and Ellen moved to Scrimshaw’s Mill adjacent to the Grantham Canal south of Bottesford, They plied the trade of milling and baking. In 1896 Frank left school to become an apprentice at the family mill. By 1901 the family had grown to nine children including Thomas (18) who is not recorded as living at home. The other eight children lived with their parents at the Mill – Nellie (19), Frank (17), Ernest (14) Bertha (12), Mabel (10), Elsie (7), Edgar (6) and Evelyn (4). By 1910 Frank had made the decision to emigrate to Canada. 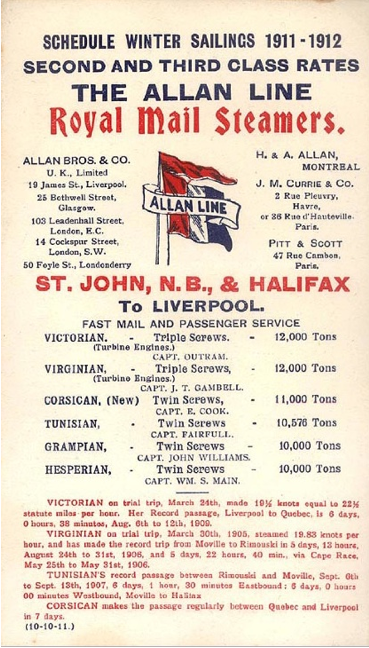 He sailed on the S.S. Corsican out of Liverpool on the 24th March and disembarked at Halifax, Nova Scotia. By that time Edgar was now apprenticed as a miller with his father. Sadly two of Charles and Ellen Raithby’s sons were killed in the 1st World War. Edgar, their youngest son, served as a machine gunner and was killed in action in October 1917 in East Africa aged 23 years. One year later, close to the anniversary of his death, Frank died of wounds whilst serving with the Canadian Infantry in the final weeks of the conflict. His emigration, settler life and subsequent military service reveal a man of enterprise, resilience and courage. There is no trace of exactly where Frank first settled in Canada. 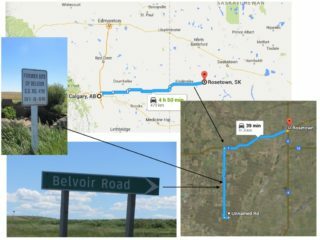 He was clearly determined to pursue the life of a homesteader in Western Canada. 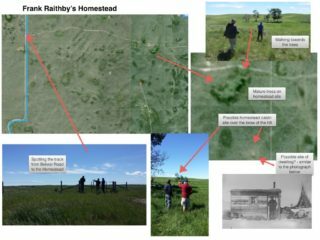 By January 1912 he had applied for a homestead in south-east Saskatchewan at Parkbeg near Moose Jaw. 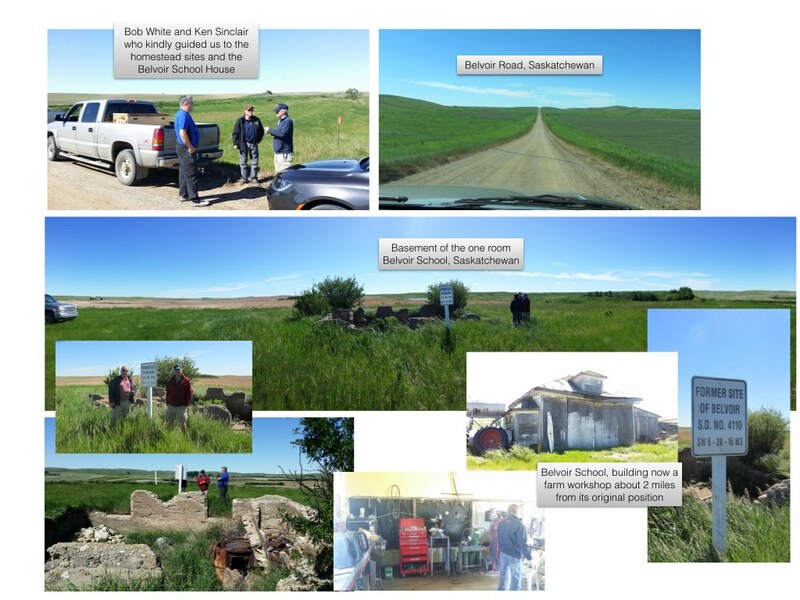 To encourage settlement in Western Canada, the Federal Government granted free homesteads of 160 acres (also known as a quarter section) for a $10 registration fee to those individuals and families who were prepared to live on and cultivate the land during a qualifying period of time. Within six weeks Frank declared the land at Parkbeg as unfit for farming and applied to relinquish it ‘at once, please’. By early May he had moved north west some 200 miles to the small community of McGee. On the 9th May 1912 he applied for another quarter section near the recently established community of Belvoir. Thomas Calcraft from Muston near Bottesford, with two of his brothers Arthur and Frank, had settled as homesteaders close to Rosetown. Thomas named the newly established school district ‘Belvoir’ after Belvoir Castle. Frank was now part of a group of homesteaders from the Vale of Belvoir. They would no doubt work together to fulfill the conditions required of homesteaders in order to apply for full ownership of their farmland. 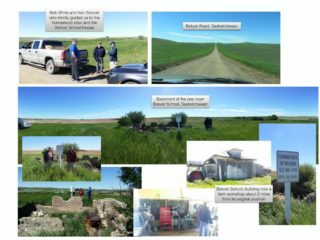 The virgin prairie grassland required dedicated work to put it under the plough and to crop the minimum of forty acres within the first three years of residence. In addition, it was necessary to build a habitable house and reside on the homestead for no less than three months. Frank had achieved all of this by the spring of 1915. By which time Canada had ‘mobilised’ and the young men who had pressed west in search of a new life responded enthusiastically to enlist before the opportunity was lost to see active service ‘back home’ in Europe. 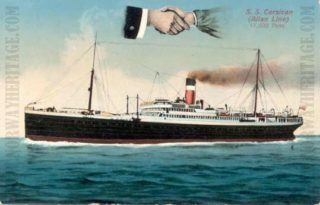 However, on the 2nd January 1915 it had been necessary for Frank to take out a ‘relief loan’ of $25.00 to cover provisions, fuel and seed grain. It is unlikely that Frank ever sowed that seed grain before enlisting, aged 31 years, in Regina on the 6th April 1915. Doubtless he would have been able to call on the Calcraft brothers to look after his homestead in his absence. The general opinion of the time was that the war would be short. He would have fully expected to return in time to meet the loan repayment deadline of the 1st January 1916. Prior to his departure he also applied for full ownership of his quarter section. This was approved on the 23rd July 1915 by which time he was in training in Manitoba at Camp Hughes with the 46th Battalion of the Canadian Expeditionary Force. The 46th Canadian Infantry Battalion (South Saskatchewan) was established on 1st February 1915, in Moose Jaw. The Battalion moved to Camp Sewell, Manitoba (also known as Camp Hughes) on the 28th May 1915 where Frank Raithby joined them for his initial training. Frank Gilding also from Bottesford, enlisted at Camp Hughes in early May 1915 and would have been at the camp for his first three months up to September 1915. They may well have met and shared news from Bottesford. Notwithstanding Frank’s experience of hard manual labour as a homesteader the rigours of training took their toll. He was hospitalised for five days in mid August with tonsilitis. He embarked from Halifax, Nova Scotia on the S.S. Lapland with the 46th Battalion on the 21st October 1915 arriving ten days later at Devonport, England, on the 30th October. He would have then completed his training at Shorncliffe near Folkestone before proceeding on active service in France on the 16th June 1916. Frank was one of a number of men who were deployed from the 46th to other units. He was posted on to the 3rd Battalion, CEF as a signaller joining them ‘in the field’ the the 17th June 1916. Whether he would have survived the war with the 46th is questionable. It became known as the ‘Suicide Battalion’ with a 91.5 percent casualty rate. As it was he arrived in the field just as the 3rd Battalion was taken out of the front line action at Battle of Mount Sorrel East Ypres in Flanders. For the rest of June they supplied working parties and underwent further training until reassignment for front line action on the 7th July, again at Mount Sorrel where they remained until 11th July. Another two weeks of training followed in support trenches before relieving the 8th Battalion, CEF in the front line. Charles Pacey and Arthur Gilding served with the 8th Battalion. Both were fatal casualties by the end of the year. The pattern of front line duty and further training continued and Frank moved on 11th August with the Battalion to Tournehem near St Omer. 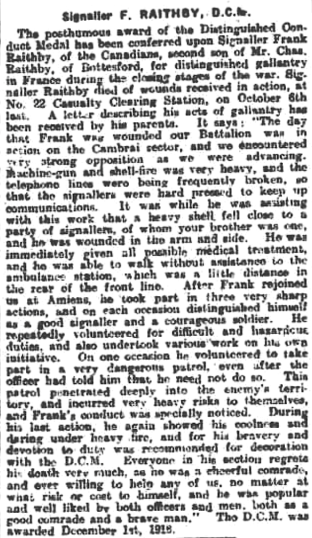 On the 27th August 1916 Frank was admitted to Hospital at St Omer. His record states that he was ‘not yet diagnosed’ (NYD). However, his condition worsened and he was transferred to Boulogne with a diagnosis of ‘myalgia’ and then ‘influenza’. He remained in hospital until 28th September 1916. After discharge he was posted to a ‘base detail’ (holding camp), to await redeployment. The reason for the extensive periods of training became apparent to those who remained with the 3rd Battalion. They were transferred to the Somme where they engaged in actions at Pozière, Flers-Courcelette, and Ancre Heights. Frank Raithby eventually rejoined the 3rd Battalion on the 10th November 1916 just as they were transferred from Picardy to Camblain L’Abbe east of Arras. It would not have been easy rejoining a battle hardened unit that had taken severe losses. For example, at the Battle of Ancre Heights on the 8th October of the 14 officers and 481 Other Ranks who went into the assault only 1 officer and about 85 Other Ranks returned. 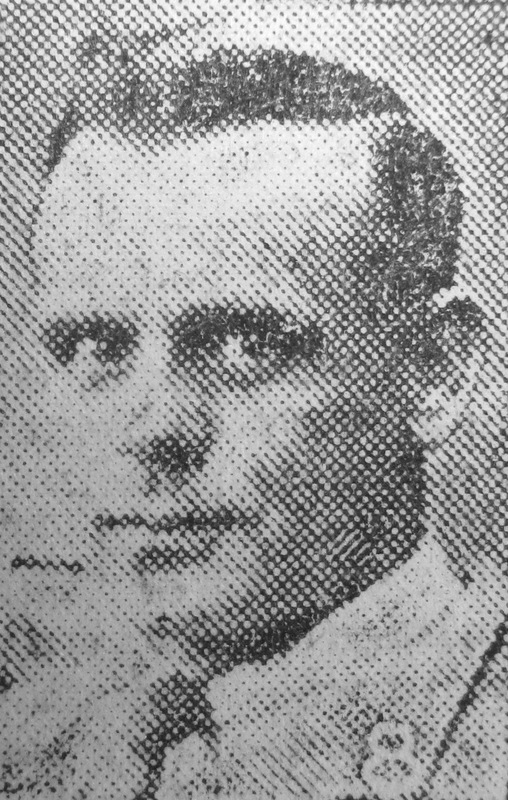 However, Frank Raithby would have more than proved himself to his comrades as someone ‘ever willing to help any of us, no matter at what risk or cost to himself’, in addition to demonstrating ‘bravery and devotion to duty’ resulting in the award of a posthumous Distinguished Conduct Medal (DCM). On his return he was involved in three major assaults with the 3rd Battalion. First in April 1917 in the Battle for Vimy Ridge, the taking of Fresnoy near Arras in May and then in August 1917 at the Battle of Hill 70. All these engagements were at considerable cost to Canadian Forces including the 3rd Battalion. The Battle for Hill 70 was a diversionary attack designed to draw German forces away from the 3rd Battle of Ypres to the north in Flanders. The Canadians attacked on the 15th August 1917 capturing many of their objectives. They then held their positions against German counterattacks over the next four days. Initially in a support role the 3rd Battalion completed their move up to the front line by 2.35 am under heavy shell fire. It is likely that this was when Frank Raithby sustained multiple shrapnel wounds to the left ankle, right forearm and left thigh. 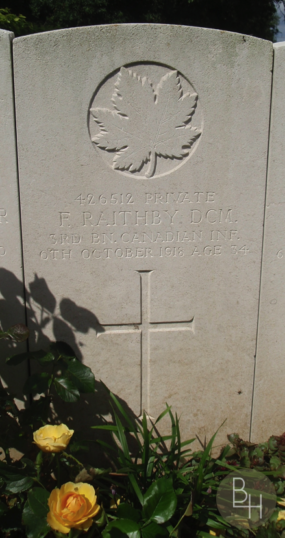 He was one of 9,000 Canadian soldiers killed or injured during the assaults on Hill 70. It was estimated that the German forces lost 25,000 men. Frank Raithby’s recovery was not straightforward. He developed septicemia in his right arm. This required extended treatment in the 5th Southern General Hospital Portsmouth and the Military Convalescent Hospital Epsom. He was eventually discharged two months later on the 29th October 1917. Meanwhile the 3rd Battalion continued its front line action leading up to their deployment in the Battle of Passchendaele in October 1917. There, as part of the 1st Brigade, they led the final assault in early November. Frank Raithby was spared from the heavy Battalion losses for a second time. Many experienced men were lost from the Canadian Corp at Passchendaele. For example, Charles Bend from Bottesford who had also emigrated to Canada. Charles Bend was a very experienced Sergeant with the 1st Battalion. He had survived much front line action and was killed during the 1st Brigade’s assault on the Paschendaele Ridge. Frank was now the last survivor of the five Bottesford men who had settled in Canada before the 1st World War. Aged 34 years with front line experience such men as Frank were needed to train new recruits to reinforce the much depleted Canadian battalions who had fought in the 3rd Battle of Ypres. 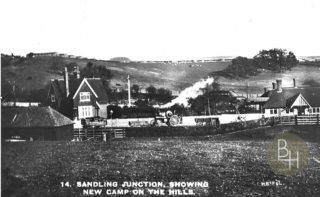 As a seasoned soldier he was sent on base duties to Shorncliffe near Folkestone at the East Sandling Training Camp. After Frank Rejoined us, at Amiens he took part in three very sharp actions, and on each occasion distinguished himself as a good signaller and courageous soldier. Before his commission in 1917 George Fraser Kerr had served as a Private with the 3rd Battalion from 1914. He may have served in the ranks alongside Frank Raithby. It is clear that Captain Kerr knew Frank had ‘rejoined’ the battalion after an absence. Not the sort of knowledge a commanding officer would necessarily know when writing one of the many letters they sent to grieving families. 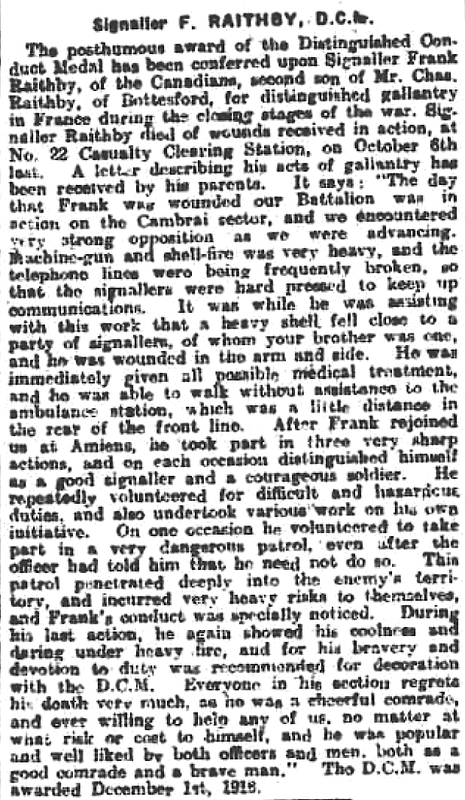 There is also further evidence of a special link between the two soldiers in Frank Raithby’s own gallantry award and the circumstances of his injury, medical care and death to be described later. 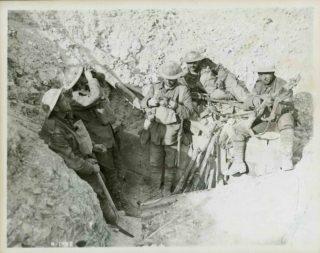 On the 8th August, the Canadians advanced nearly 7.5 miles through the German defences, the most successful day of combat for the Allies on the Western Front. However, German reinforcements prevented an Allied breakthrough, and fighting became more difficult and costly. Throughout the rest of August and early September the Battalion was involved in extensive fighting in moves take the well defend German Drocourt-Queant line east of Arras as precursor to crossing the Canal du Nord and an advance on Cambrai. Before the advance on Cambrai could be achieved it was also necessary to take the heavily defended German stronghold of Bourlon Wood. This would then open up access to the Arras – Cambrai Road. By the end of September the Canadian Forces had crossed the Canal du Nord. 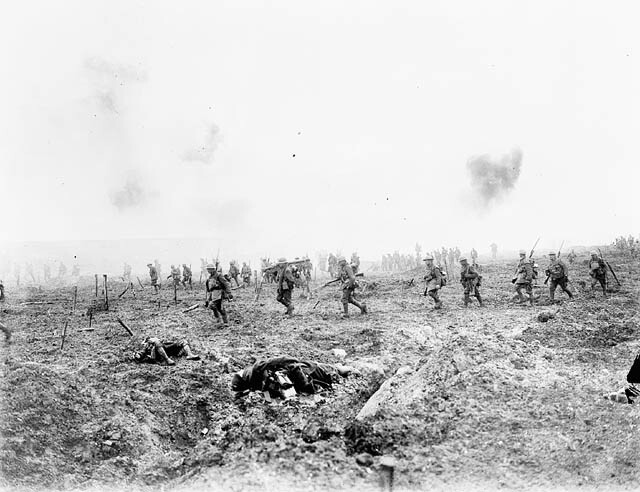 On the 27th September the 3rd Battalion played a critical roll in the taking of Bourlon Wood. Of particular note were the actions of George Fraser Kerr. Whilst commanding ‘B’ Company he rushed single handed a well defended German position near the Arras-Cambrai road and played an important part in the advance of the 1st Brigade. He was awarded a VC for his action on that day. [London Gazette, 6 January 1919 ]. Bourlon Wood, France, 27 September 1918, Lieutenant George Fraser Kerr, MC, MM, 3rd Bn, 1st Central Ontario Regiment, Canadian Expeditionary Force. Frank Raithby also received a gallantry award. The London Gazette citation for his DCM reads along similar lines. 426512 Pte. F. Raithby, 3rd Bn., Can. Infy. For conspicuous gallantry and devotion to duty during the Bourlon Wood operation on 27th September, 1918. 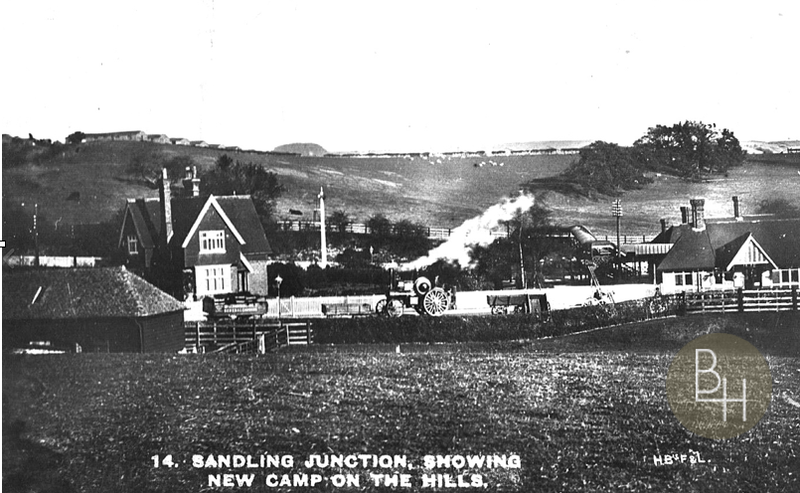 As a signaller he pushed forward with his company commander, and under heavy fire kept communication with the battalion headquarters, enabling them to keep in close touch throughout the operation. On one occasion, when fired on by a 5.4 howitzer, he single-handed captured the gun and then killed the crew. His courage and conspicuous gallantry were a fine example to his comrades. The 3rd Battalion sustained over five hundred casualties in the Bourlon Wood action. By the 29th September 1918 they had moved on to the village of Haynecourt where they were the target of high explosive shells. Frank Raithby was wounded on the 1st October by fragments of shrapnel whilst repairing telephone lines. He was initially listed as wounded. Sadly as the entry in his burial register records he succumbed to his wounds five days later and died on the 6th October 1918. While attached to ‘B’ Company as a signaller and when assisting with the repair of telephone lines at Haynecourt on the morning of October 1st 1918, he was hit in the shoulder by a piece of shrapnel from an enemy shell which exploded near him. He walked to the nearest Dressing Station and received immediate attention, and was evacuated to No. 22 Casualty Clearing Station, where he succumbed to the effect of his wounds five days later. There is something about the succinct eloquence of this report that indicates that the author had personal knowledge of Frank Raithby. His particular Company is identified. ‘B’ Company was commanded by George Fraser Kerr. There are vivid details concerning what Frank Raithby was doing in assisting with the repair of telephone lines. The location is also precisely identified, as is the time of day – ‘on the morning’. The injury is not a perfunctory ‘died of wounds’. It is described as an injury to his shoulder resulting from a piece of shrapnel from an enemy shell. This is no mishap of war. This is person who is identified precisely as someone wounded in action attending to his line of duty. Furthermore, his specific conduct and the outcome of his wounding is recorded as in eye-witness testimony – he walks to the nearest dressing station. His treatment is immediate. This a person who in the face of a life threatening wound takes care of himself. Equally the field medical facilities are readily to hand. His treatment is therefore the best there is under the circumstance. In addition, we see that notwithstanding this care and his evacuation to Casualty Clearing Station No 22 he ‘succumbed to the effect of his wounds.’ Although initially listed as a ‘wounded in action’ the Battalion War Diary was then amended to record his death. Somebody cared about Frank Raithby beyond the routine recording of one more casualty. They took care to mark the specific details of his wounding and death. The wording of the letter home to his parents after his death also bears a remarkable resemblance to the burial register entry. The letter reported in the Grantham Journal adds further graphic details about the circumstances of Frank Raithby’s injury and again refers to him by his first name. The day Frank was wounded our Battalion was in action on the Cambrai sector, and we encountered very strong opposition as we were advancing. Machine-gun and shell fire was very heavy, and the telephone lines were being frequently broken, so that the signalers were hard pressed to keep up communication. It was while he was assisting with this work that a heavy shell fell close to a party of signallers, of whom your brother (sic) was one, and he was wounded in the arm and side. He was immediately given all possible medical treatment and he was able to walk without assistance to the ambulance station, which was a little distance behind the rear of the line. Both the the burial register entry and the letter to his parents (and or brother) look to be written by the same person. Perhaps the same person who cited him for the posthumous DCM. Surely his Commanding Officer George Fraser Kerr. George Fraser Kerr survived the war but sadly died in December 1929 in Toronto of carbon monoxide fumes whilst warming up his car. As for Frank Raithby’s twenty five dollar Federal Relief Loan granted in January 1915. That became a charge against his homestead. The land passed into new ‘ownership’. However, the loan was never discharged and the homestead was subject to forfeiture by the Canadian Government in 1930. Numerous documents in the Saskatchewan Homestead Archives diligently record the accrual of compound interest at 5% per annum until 1953 by which time $72.25 was owed to Federal Government of Canada. On the 2nd April 1953 his homestead was deemed as not having ‘any value or subject to taxation. As such the land no longer offers any security of value’. Cancellation of ‘indebtedness’ resulting from the loan in 1915 to Frank Raithby was recommended. In those documents there is no mention of Frank Raithby’s death in the service of his adopted country and its indebtedness. The land he worked has now reverted to community pasture. Once more a rolling landscape of seemingly untouched prairie grassland affording the same views Frank would have seen on arrival. Our sincere thanks to Bob White and Ken Sinclair for guiding us to the site of Frank Raithby's homestead.